My grandmother was the only girl amongst a bunch of boys. They were big men physically, but rowdy boys most of their lives. My great-grandmother, as with most mothers, thought the world of her boys, even if the boys seemed to have rocks in their head occasionally. On Mondays, without fail, my great-grandmother would bake a cake and frost it. This was in preparation for her son Jack's impending visit. My great-grandfather, a day or two into the week, would suggest they have a piece of cake. No, his wife would firmly declare, "That's for when Jack comes." You likely know how this turned out. Jack rarely came, and the family was left eating stale cake. Every. Freakin'. Week. Not only was Jack the crowned prince, but there was food for him that he never even bothered to get, even just to please his mother. We find Jesus in a similar position: He's got the food and people turn up their noses. "Not for me!" "I'm gluten-intolerant." "Ew, all those other people touched my food; gross!" Okay, I don't know exactly what was said, but we know that Jesus prepared the meal, set the table, invited everyone ... and people ran for the hills. Jesus (and my great-grandmother) wanted to serve the best, because of love. And any country cook and big city chef knows something both Jesus and my great-grandmother knew: food is never just food. (Unless you're Giselle Bundchen, who seems to survive on tree bark.) Food is love. It's community. It's a recipe passed on from one generation to the next. Maybe it's just my family, but we still talk about food that my parents and their parents served. Rutabaga, anyone? Carrot cake baked in a coffee can? Roast the turkey, fry the turkey, undercook the turkey? No, Jack never came. (Well, he did show up sometimes, but it usually ended in a fight of some sort.) The cake got stale, and no one was happy. Jesus offered a new food, with a new promise, and many people decided this was too much. They turned down a gourmet meal for McDonald's. Jesus wanted to feed them; they said, "No." My grandmother told everyone but Jack, "That food isn't for you!" Some of Jesus' disciples said, "This food is not for me!" Food is life, and Jesus' food is eternal life. Don't miss out because you are too busy with other things or worse yet, miss out because you, like some obstinate 7 year old, deciding "It's gross!" when met with a new food. 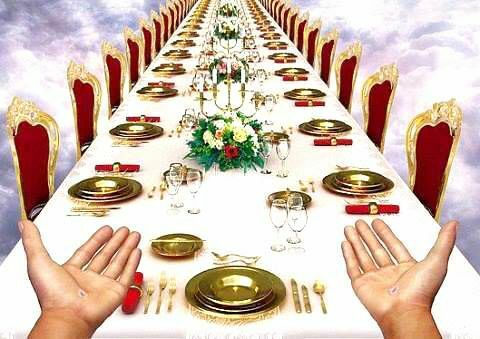 The table is set, the cake is baked the food is ready, and Jesus awaits. Come, eat rich food and celebrate with us!